It is 1729, pre-revolution France. The aristocracy is still in charge, but history ius catching up with it. You, a wealthy, well-educated aristocrat, realize that in order to say strong, your family must prepare for the change that is coming. Your family must find new allies. You will have to absorb smaller families and use their influence to strengthen you kin. 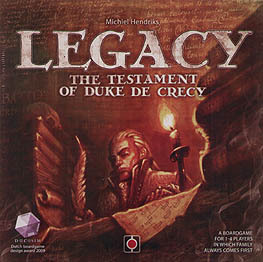 The Legacy: Testament of Duke de Crecy is a fun board game for 1-4 players, in which you strive to establish a lasting legacy over three generations. Take control of your family and secure the fate of your children, your grandchildren and great-grandchildren. Find them the best spouses from all walks of life, and from nations wide and far. Offspring, honour, wealth and influence - they all play a role and will determine whether you will succeed or fail. Do not hesitate to make tough decisions, but remember: Family always comes first!